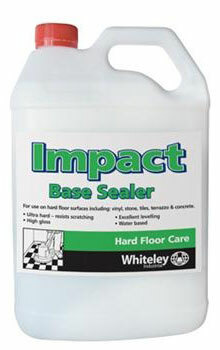 Impact Base Sealer is a clear, non yellowing, UV resistant, penetrating Sealer. Suitable for use on Stone, Terrazzo, Tiles and Concrete. Impact Base sealer provides a hard, durable and low maintenance finish to all types of hard floor surfaces (including vinyl, stone surfaces, quarry tiles, ceramic tiles, terracotta, terrazzo, granite, cement surfaces, pavers, polished and stencilled concrete). Impact provides a semi permanent seal that eliminates the need for regular stripping and will last from 2-5 years depending on environmental wear factors. Impact provides a stable base coat for Thermaglo or Brilliance Sealer Finishes where a buffable finish is required for Ultra High Gloss. If required remove any old finishes using Hornet, Storm or Zip Strip (if acrylic seals) or Fabrisolv for solvent type seals. Clean surface then rinse area and allow to dry. If surface has any marks or oil residues (i.e. concrete), scrub surface with Tempo HD or Citron to remove marks prior to sealing and then rinse area thoroughly and allow to dry. Always seal a small test section of floor to ensure proper surface adhesion before sealing entire floor surface. Click here for Impact Sealer MSDS.